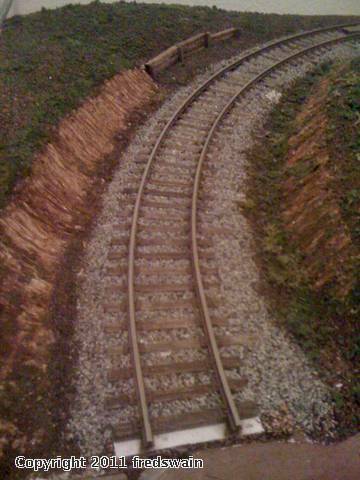 This will be a small 4X8 layout using code 172 rail and outside third rail for power. 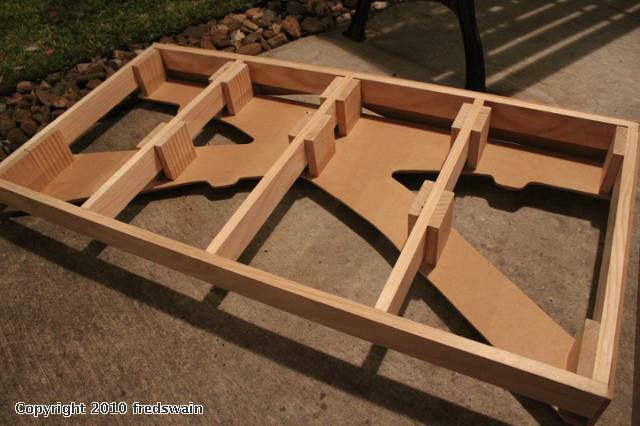 It is built in 4 sections, each 2X4 feet which can bolt together or be used as modules in a larger layout. I am building it first because I have a lack of large permanent space but also to show others that you don't have to have a large space to still have a realistic looking O scale layout. I am also showing that you can build a nice layout that can expand as your available space does. This will be all open grid construction with foam forming the landscape. Each module needs to be lightweight yet strong. Open grid construction is chosen for it's design flexibility but also because it will help with track noise control. 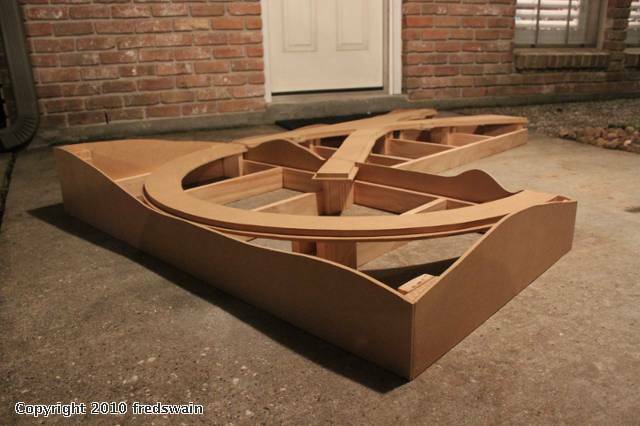 This layout will have many features incorporated into it's diminutive size. The design will be pretty simple. A simple loop was deemed a good choice. I get bored easily though so a couple of industries are needed and if you look closely the left hand side of the layout can be operated as a small Inglenook puzzle. A mine scene may be fed by these 2 sidings split with a #5 switch and a second industry will have it's own siding. I'm not quite settled on it yet. We'll see as construction progresses. The end of the layout that features the mine scene will be mountainous with either a tunnel traveling through it or a very deep rock cut. The opposite side of the loop will run through a wooded scene full of tall pines with a small branch line water tower and a grade crossing running through it. The front of the layout will be the switching and industrial areas while the back half will be some form of a water scene, perhaps a little stream complete with a wooden trestle crossing over it. 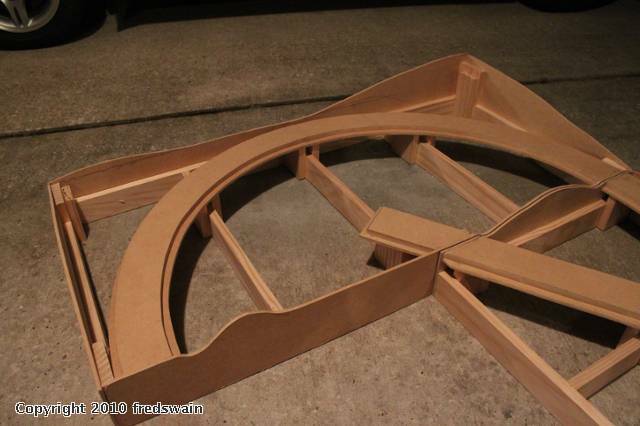 All curves will be a tighter than optimum 21" radius but will serve the purpose of the layout well. All rolling stock will be held under 40 scale feet in length and will have body mount couplers. Yes you can do body mounts on tight curves but you have to limit yourself to shorter rolling stock. This track plan allows flexibility. It can be expanded in any number of ways. The 21" radius curves could be replaced at a later date. Straight sections could be added. Curves to take it around a room corner could be added. It could be arranged into a point to point layout. You get the idea. It's expandable. I didn't want a layout that I'd get sick of and tear down later but rather one that could grow as my abilities and usable space does. Then again I get tired of what I have pretty easily so it may just end with this setup too. 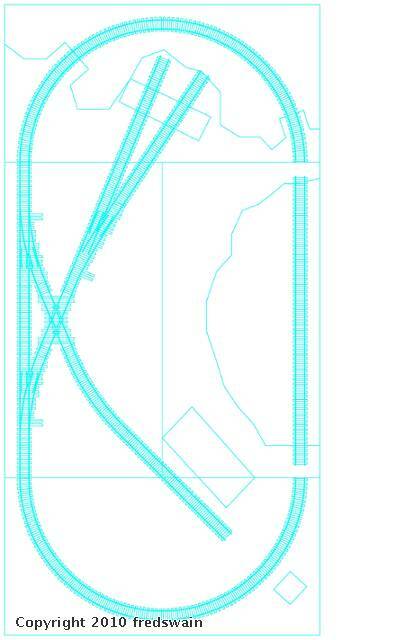 Attached is a crude track plan drawn in AutoCAD. Rotate it 90* counterclockwise to see what I will consider the "front" although every side will be designed with the intent that it could be the center of attention. The key to illusion on this layout will be scene preparation with scenic view blocks and attention focusing elements. From track level with strategic photography, the layout will appear far larger and longer than it is. The rear track that doesn't connect in the drawing is still an orientation that I have yet to work out. It may go straight or it may be a sweeping curve. I'm not sure yet. I have been asked about the railroad tie arrangement in places. This was drawn up using Ross track templates so anything you see is exactly as they do it. I'm going to hand lay this but their track drawings were perfect for my needs on paper so that's what I used to lay it out. Last night I started construction but didn't have my camera anywhere nearby. I went over to my parent's house to do this as they have a nice yard and all of my tools are there. Since I currently live in an apartment I really don't have much room to build anything. The front and end frameworks are built. The framing is select pine 1X3's. 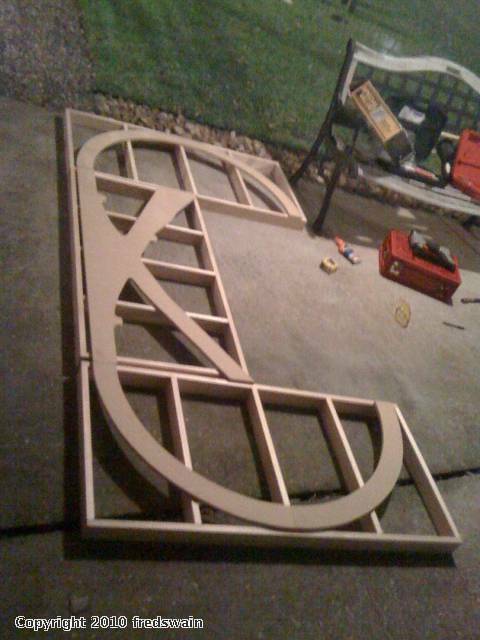 Each section is built at 23-1/2" X 47-1/2" in size. You may be wondering why I am a half inch off of a 2X4 section as I stated they will be 2X4. That extra half inch is actually a quarter inch per side. I am going to use 1/4" wood on the ends that will be cut into the terrain profile that I want and everything will be built up to match. When complete they will end up being 2'X4' in size. As shown in my layout drawing, the single siding on the right crosses the junction of 3 modules. That is only on paper as I have modified it a bit lower to miss that spot. 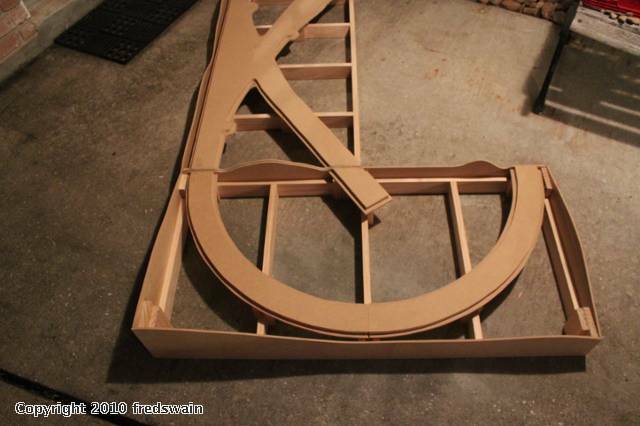 In the current picture you can see that I have wood cut out only underneath where the track will sit. Remember, this is open grid construction. Foam will build out the rest. 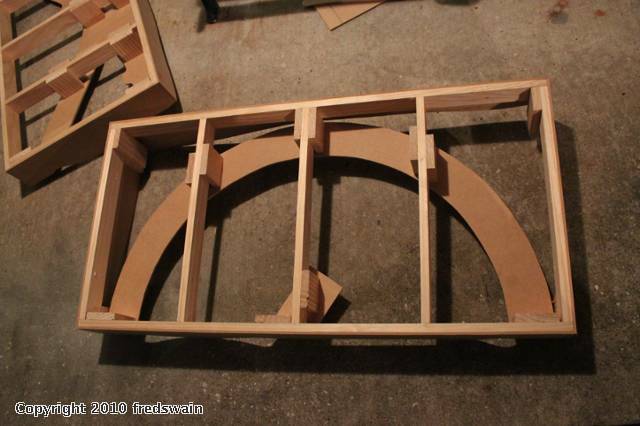 The subroadbed areas are not pine or plywood like the framework but instead are 1/2" mdf. This was chosen due to it's density and acoustic properties as it doesn't amplify noise to the extent that plywood does. Although not attached yet in this photo, these sections will be raised up off of the framework. The top surface of the subroadbed will be exactly 2" above the top of the frame below. This will allow me to have scenic elements both above and below track level which adds interest. The subroadbed will be attached to the support risers with 3M contact cement rather than screws or nails. This is to help yet further isolate noise. Contact cement is actually quite strong when done properly and once all other scenery is installed around it will be very secure. Any amount of dampening, even in small amounts in strategic locations, will go a long way to having a fairly quiet layout and it is still possible to have a layout that isn't heavy. The back section has not been built yet. I plan on doing it tomorrow as nothing will get built tonight. This section will be a little different than the other 3 which have identical frames. 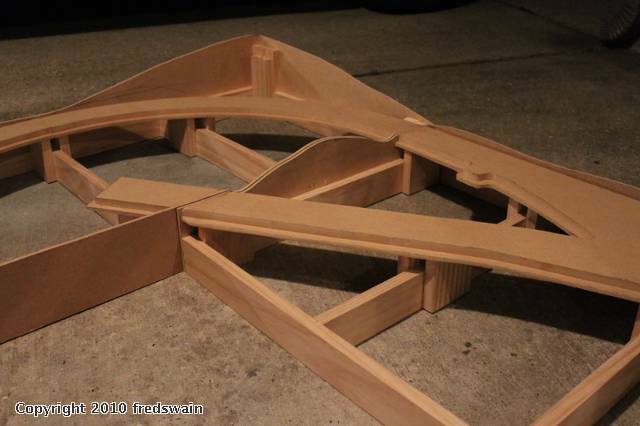 This last frame structure will have a recessed area for the water scene that the trestle will traverse. The water area will be recessed exactly 2" below the top of the main framework. My goal for the rest of the week is to get this rear frame built and the rest of the subroadbed pieces cut as I have a couple more to go. The subroadbed pieces are cut to 3" in total width. Anyways, here is the grainy picture. Again sorry about the quality. It was taken on a phone. Incidentally, the frame structure of each section only weighs 5 lbs. This is not including the subroadbed but the point is that this will not be heavy when complete. Looks very nice so far Fred - looking forward to the future installments in this series. Here is the general framing of the subroadbed. It is 1/2" MDF with a 1/4" piece attached underneath that is 1/2" wider. This creates a lip that gives options. I am going to use the lip as a support for the foam that I am going to build the rest of the layout from. However if I ever need to widen the subroadbed for some reason such as for a switch stand or for a signal, it is easy to add a piece of wood to this for support. Options are good! 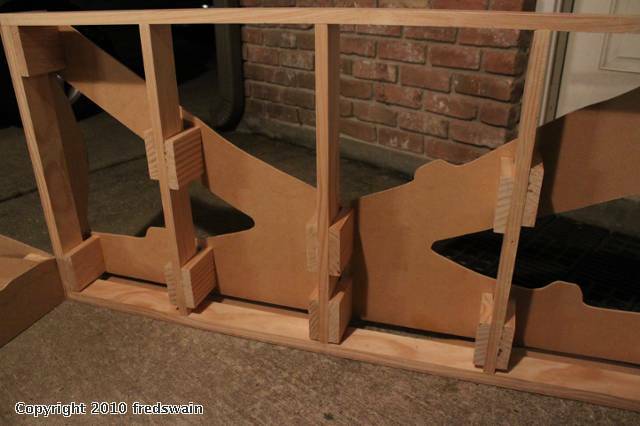 I used 1" x 4" wood for the supports. The top of the subroadbed is exactly 2" above the top of the frame braces. I haven't updated this in a while since I never finished it. It's ongoing. I have gotten a bit done on about half of it though. 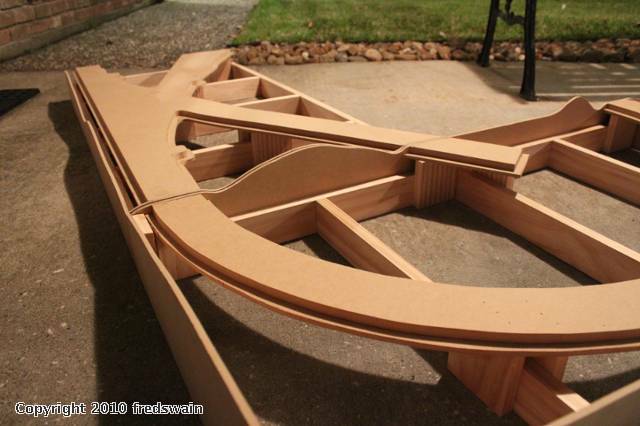 You can get an idea of what my ultimate track work and scenery will look like. It is all hand laid steel code 172 rail on individually distressed and stained wood ties. Each tie has tie plates and spikes. The outside rail will be code 100 but is not installed yet. You can see the longer ties that will hold the outside rail supports. This pictures shows an end module under construction. The cut is still being worked on. The retaining wall in the background is the site of a future water tower. I'll post more of this as I progress but overall this layout is being worked on slowly.